I had been previously to Metropolitain, back when it first opened. The concept then was to serve small "tapas"-style dishes meant for sharing. I got the feeling that it didn't do too well, and the chef was replaced by none other than Brent Beavers, the former chef from the now defunct Sencha. 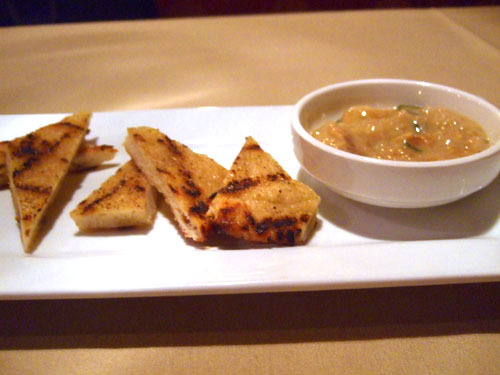 Beavers, I believe, is now at the Ritz Grill, while the current Executive Chef is Marcus McCoy. 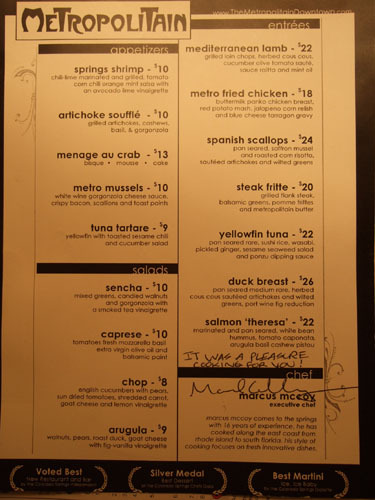 McCoy has gotten rid of Metropolitain's old focus of small plates, instead infusing a more traditional menu setup. According to my server, this rationalization allows him to better ensure the quality of ingredients (the former menu was about three times as large). 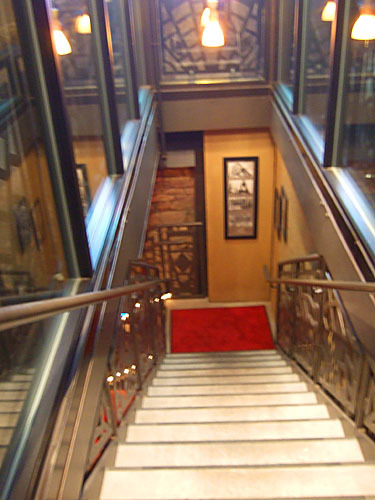 One enters Metropolitain through a subway style entrance. It's very easy to miss if you don't know what you're looking for. 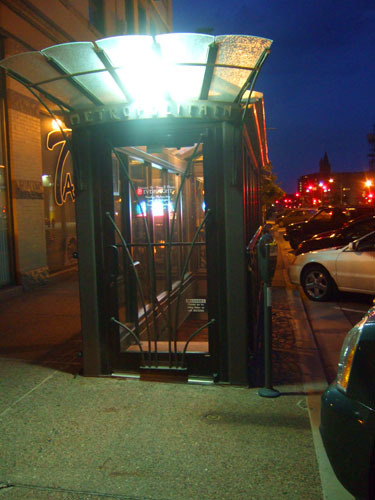 Unfortunately this seems like it would prevent much walk-in traffic. 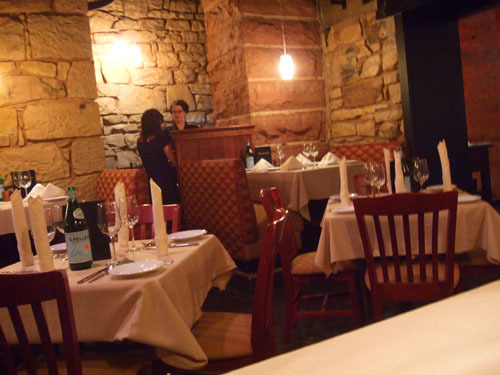 The subterranean dining room is warm and cozy, with space for around a dozen tables. There is also an adjoining bar/lounge area. 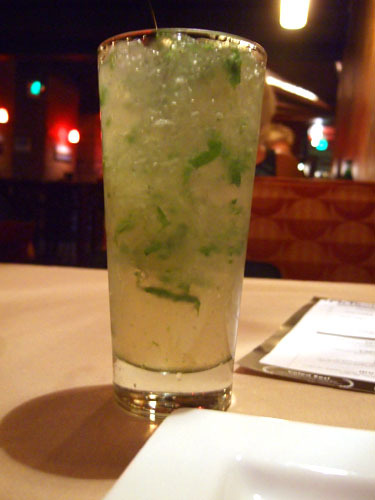 As usual these days, I started the meal with a mojito. This was simply one of the best I've ever had, and I made sure to send my regards to the bartender. Compared to the old Metropolitain, the menu is vastly more focused. Note the "Sencha" salad; Beaver's legacy lives on here apparently. The salmon "Theresa" is named after the chef's wife. Click for a larger version. 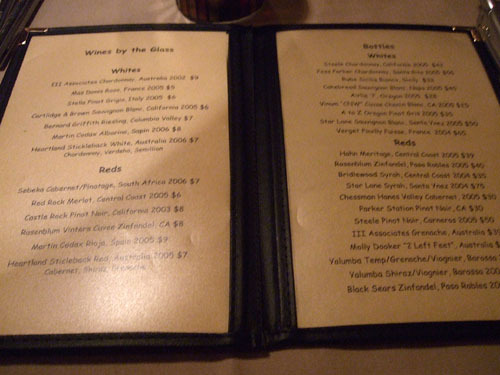 The wine list is small but fairly diverse. I had a glass of dry Riesling from Bernard Griffith, Columbia Valley. Click for larger version. The flatbread was excellent and reminded me a bit of Chinese onion pancake in texture. The sauce was a slightly sweet onion dip with honey and basil. One of the tastiest bread presentations I've had in a while, this compares favorably to the superb bread and hummus at the popular Blue Star. 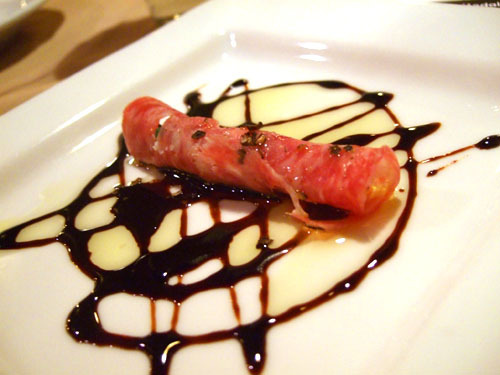 Salami wrapped around arugula salad and goat cheese, with olive oil and balsamic vinegar. I was pleasantly surprised that they were offering an amuse (they didn't last time I was here). I guess it may be part of the new menu and an attempt to go more upscale. Three preparations: bisque, mousse, cake. The mousse was like a very nice crab salad, while the cake was generous and without too much filler. 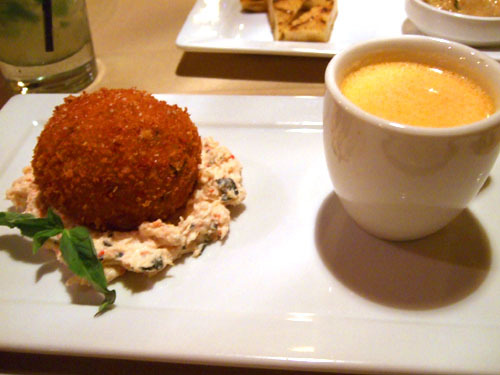 The weakest of the troika unfortunately was the bisque, which was a bit thin for me; I would've liked more cream. 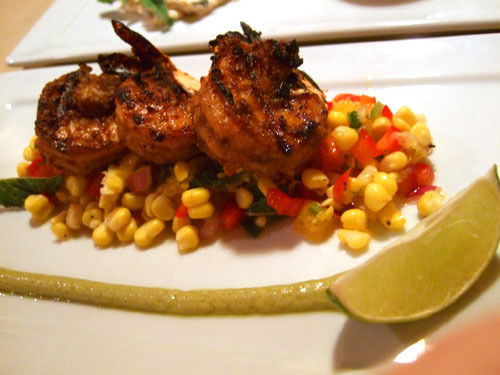 Chili-lime marinated and grilled, tomato corn chili, orange mint salsa with an avocado lime vinaigrette. The shrimp had great texture and a fantastic smoky flavor. This was my favorite dish of the night and left me wanting more. 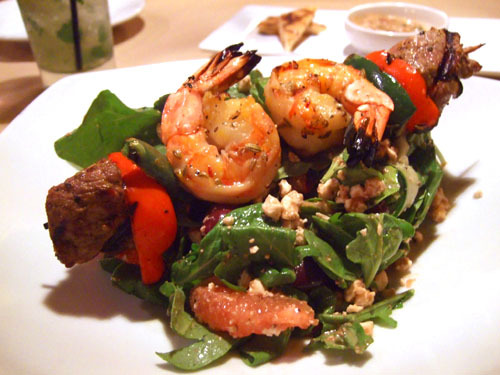 Grilled shrimp, filet mignon, red pepper, and jalapeno skewers atop a Greek salad of spinach, feta, grapefruit, tomato, cucumber, and olive. The filet was tender and the shrimp well cooked; both were delicious. Even though I'm not much of a salad person, I still enjoyed it here. However, the amount of salad was simply too much, especially since this was an appetizer portion, and I struggled to finish it. The amount would be perfect for a lunch entree though. The restaurant was considering adding this dish to the menu, so I made sure to relay my comments to my server. 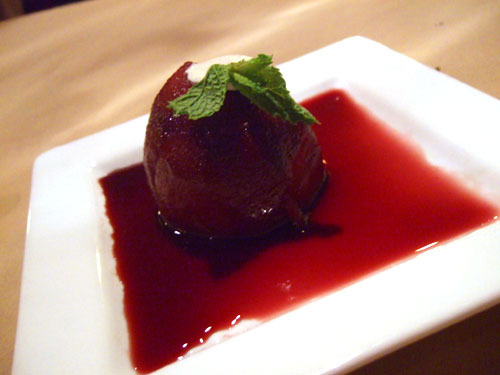 With port reduction, vanilla ice cream, and mint. This was actually my first time with a poached pear dessert. Not bad! I liked the hot/cold contrast between the pear and the cool ice cream center. I paired this with an excellent Inniskllin Vidal Ice Wine, 2004. My first outing at Metropolitain was a slight disappointment. 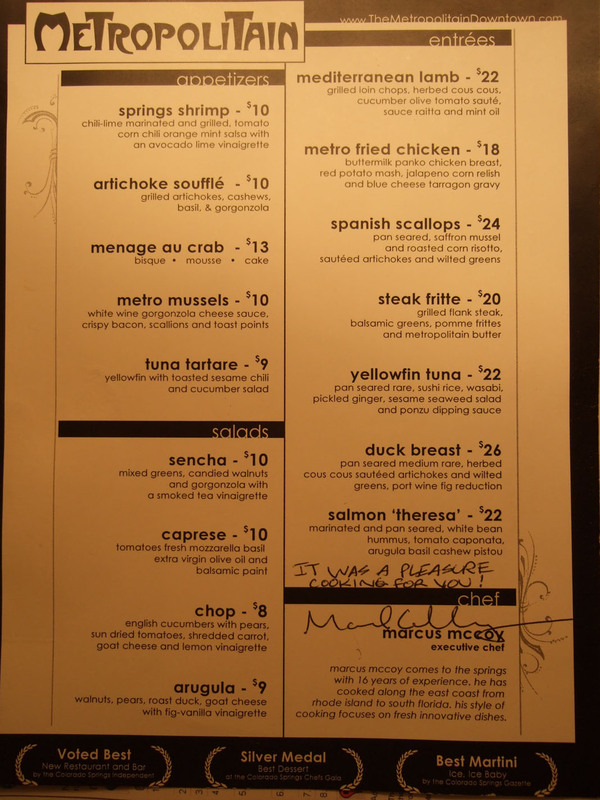 Indeed, the menu was a bit unfocused and inconsistent, but it appears that McCoy and company have since remedied that. The new set of offerings is smaller yes, but better for it. My hope now is that the chef can continue this positive momentum and perhaps lend some stability to Metropolitain.